There’s been lots of chat on the blogs and on Twitter these past few weeks regarding Lotus marketing and advertising. However, I attended Lotusphere Comes to You in London last week, and something about the messages delivered in the keynote there (which I live-blogged) really crystalised the thoughts that have been rattling around my brain for the past year or so. For those that weren’t at LCTY London (or the many other similar events held world-wide – I assume that the keynote presentation is fairly standard), the first 90 minutes of LCTY is effectively a Lotus strategy pitch, followed by 30 odd slides detailing the improvements/changes/announcements for each product in the portfolio. In London, this deck was presented by Bruce Morse but that is fairly irrelevent – my issue is with the overall message and content, not with the style of delivery. At no stage did Lotus ever tell the story behind its products, why they’re relevant to an organisation, what difference do they make to a knowledge worker’s life, how they work together to make a user’s work more enjoyable or a department more efficient… Where are the ‘day in the life’ demos, the captivating success stories, the ‘wow’ moments, the creation of desire and excitement amongst attendees, viewers or readers? Why at one of the 3 “showpiece” Lotus events in the UK this year, with 500+ customers/partners in attendance, were we subjected to 30 of the dullest text-laden “what’s new in Lotus product X” slides? However, the problem is bigger than just this event. Whether it’s the LCTY overview, the keynote at Lotusphere 2009, the new SmartWork campaign or even the Lotus product pages at www.lotus.com, I personally never get a sense that IBM is truly capturing the essence of what makes Lotus collaboration software compelling as a whole, why a new customer should be excited by its capabilities or why indeed a customer of a competitive vendor should even be interested in what Lotus has to offer. 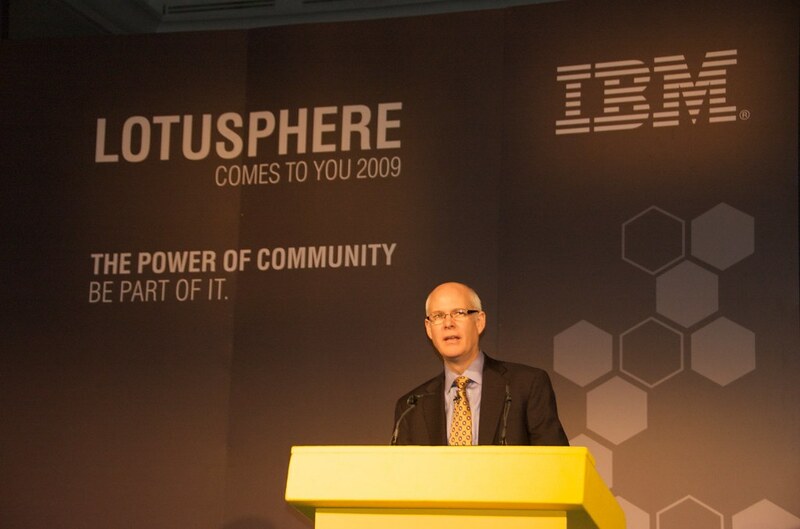 Others have stated that IBM tries to sell to the converted, to the ‘Bubble’. I think they’re right. Actually, I think it could even be worse than that, I think it’s almost as if they are trying to sell Lotus software to the IBM organisation itself. If I was head of another department in the 400,000 person beast that is IBM, I’d have listened to the LCTY keynote, and thought, ‘hey, that new release of Portal could help me save $s by implementing a new self-service travel expense composite application within w3.ibm.com’, or ‘mmm, Sametime 8.5 will really reduce the bandwidth I use when attending my 30 hours of web-conferences next week’! As the head of a 50-person ‘up and coming’ organisation from London that is faced with alternatives from Google, Socialtext, Jive, Huddle, Alfresco etc and little understanding of the Lotus portfolio beyond some buzz on the web about Lotus Connections or Quickr, I’d have walked away utterly confused at what IBM/Lotus was actually offering me or my business. So one more time, what’s the story, Lotus? Collaboration University 2009 Registration is Open!